Our Palette, the Old Masters .Academy ™ Palette, consists of both historical pigments used by Old Masters, as well as pigments manufactured centuries later after the Old Masters; and two pigments picked for the palette were invented in the 1920s. It is not possible to reproduce all pigments and mediums that the Old Masters used, besides we do not have such an intention – as the Old Masters’ “secrets” lies not in TOOLS but in METHODS of Painting; that’s why we learn how to paint like the Old Masters, using modern Materials. Our Palette consists of the most reliable paints you can depend on – all chosen Colors are based on the Colors’ endurance characteristics and also on their aesthetic look. Let’s start reviewing all Oil Colors and Oil Pigments we have on our Palette. 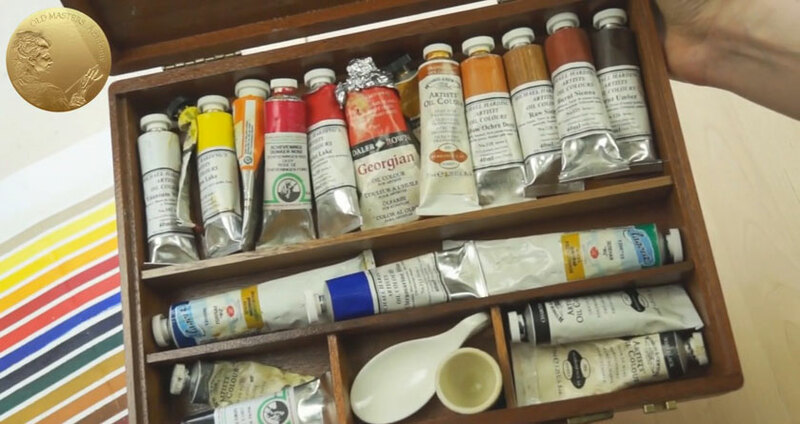 Whites are the most important and most used paints on our Palette. Almost half of the paints used in painting account for Whites. This is why it is very important to choose the right Whites and not compromise on quality. We have two options on The Old Masters .Academy ™ Palette – Titanium White and Zinc White. Each of them are efficient in certain circumstances and each is designed for different painting methods. We can roughly differentiate them as Opaque White and Glazing White. Let’s start with Titanium White, which is a very Opaque paint and actually is the whitest of all whites, which results in great covering power. Its hiding power is almost twice the Lead White which was a historical pigment of the Old Masters. With Titanium White it is easier to paint over incorrect passages, even if they are very dark. Some disadvantages of Titanium White is that it Dries Very Slowly and also it has the ability to yellow, especially with excess oil added to the paint. We need to remember, that Titanium White with added Ultramarine or Cadmium gives fragile mixtures. This White is ideal for Underpainting, which should be dense and opaque. Titanium White is a part of the Limited Titian Palette. 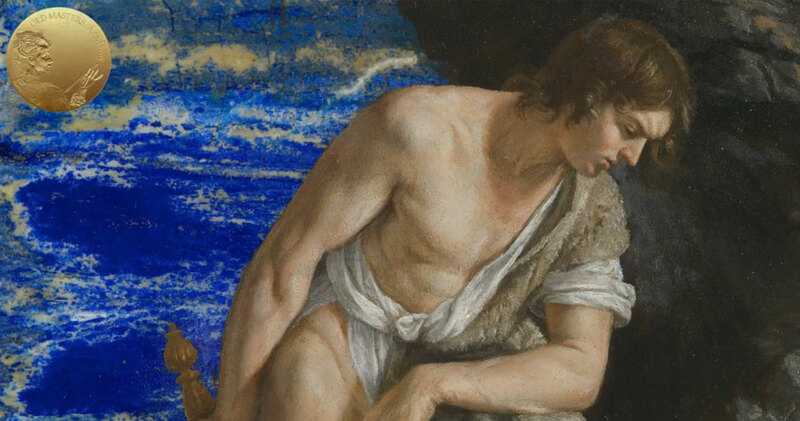 Later, we will talk about Titian’s Palette in detail. And just for the curious: Titanium White paint appeared on the market in 1920. Due to the toxicity of a Lead White, there were numerous attempts in the past to make White paint from safer materials. In 1840 an inexpensive and non-poisonous Zinc White was invented. This paint can compete with Lead White in all aspects. Zinc White is a Slow Drying White paint with cold transparency and a bluish undertone. It is not active in mixes and it lightens other colours economically. 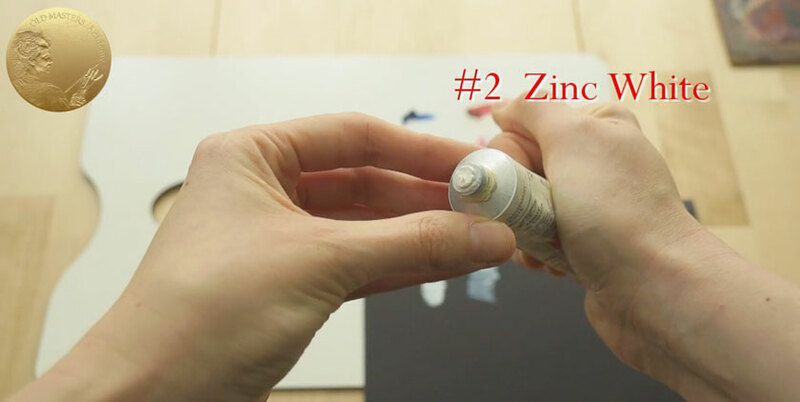 Zinc White is a flexible paint – it could be successfully used as paint for semi-transparent glazing, called Velaturas; for the Scumbling method, as well as for Alla Prima painting. There are both positive and negative qualities that characterize Zinc White. The positive properties of Zinc White include low toxicity, it is completely resistance to light, and it has the ability to help make strong durable mixtures with stable paints. Negative characteristics of Zinc White include: it has a very weak ability to cover, its drying time influences the drying time in mixes; it can make paint surfaces fragile, it has a tendency to crack and eventually this can cause lamination; and also it has a tendency to absorb a large amount of oil. Layers applied more or less opaquely can become transparent over time. Ideally, paintings that are painted with Zinc White should not be removed from the stretcher bars and be rolled up. 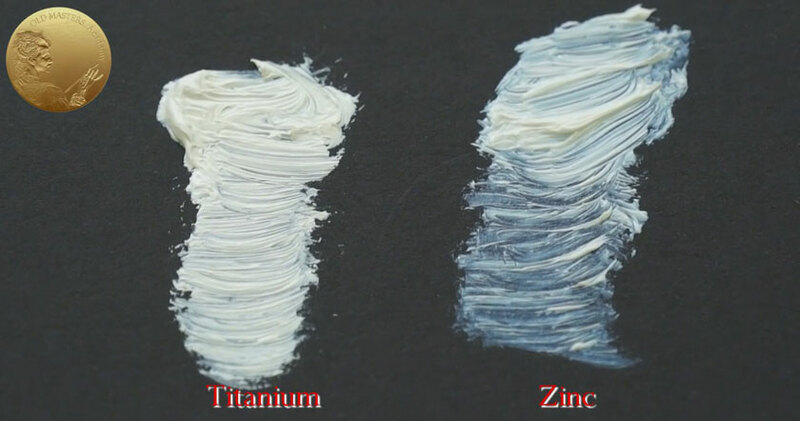 Titanium and Zinc Whites have their pluses and minuses. However the mixture of both can compensate each other. Performance is better when you mix both pigments and you can mix both pigments yourself or acquire a premixed tube of paint as in the example named “Titanium White 2”. Fast Drying qualities and exceptionally opaque characteristics make it ideal for Underpainting, especially for depicting flash; it creates good texture and a lean surface. It has an exceptionally strong tinting ability and it is especially useful if you need to paint over a mistake. In mixtures, it lightens another color very quickly; in mixtures with white it creates a beautiful off-white cooler, subtle stone-like shade. It can be replaced by Buff Titanium. An outstanding pigment with Average Drying Time; is proven to be reliable, permanent and chemically non-reactive. However it is TOXIC- you should keep it far away from children and keep your studio well ventilated (although you need to do this anyway). The color is a clear bright acidic yellow with a slightly greenish overtone. As being opaque and intense color, it has great tinting power. In mixes with Reds, it becomes a dull orange. Slow Drying and Transparent paint. Despite its transparency, it possesses strong tinting power. It has a very good lightfastness; and is permanent in color, however different sources present it as even better – pricing it as Extremely Permanent. Yellow Lake is a magical colour, which performs outstanding in mixes and transparent glazing layers. But we should be cautious using it, because of its strong tinting power – it is an extremely dominate paint. Even with small quantities it will immediately make mixes more golden or greenish in undertone. In mixes with Phthalocyanine Blue and Phthalocyanine Green it can heighten them without making them opaque. While in mixes with whites it becomes luminously opaque. The paint has an Average Drying Time. The colour itself leans more towards orange than yellow. This is a clear, deep and radiant transparent paint, which is well-known for its glazing properties. There is no another colour that can replace Indian Yellow. In thin finishing layers of glazing, it can add to the painting an exceptional vibrancy. Now we can acquire a synthetic organic lake pigment, which replaces the legendary original organic pigment which was created in a rather odd way. To create this colour, cows were fed exclusively with mango leaves. When the cows urinated into the sand, dark yellow lumps were collected, powdered and purified. Today’s equivalent of Indian Yellow matches the beauty of the original colour, but is even more superior in tinting power. Avoid mixing it with Blue Colors – it has a brownish undercolour that can make the mix less attractive. 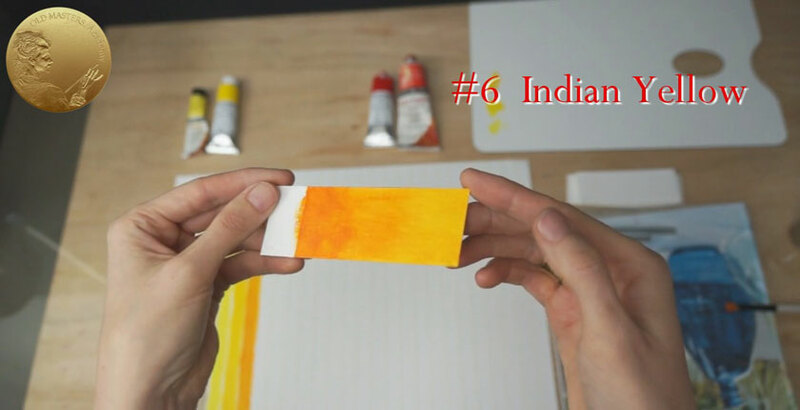 You can employ the full potential of Indian Yellow by using it in glazings. This is Average Drying paint, which is an organic strong and cool violet red, and has a slight tendency towards blue. The paint is semi-opaque and you can use it for diverse purposes – for solid Underpainting or in thin glazing layers; as well as part of a paint mix. Scarlet Lake has a very good reputation among professional artists for its visual characteristics. It is a Fast Drying paint that is always practical. Cadmium Reds belong to the latest group of artificially manufactured colors. It’s toxic, so keep it far from the reach of children and ventilate your studio well. The chemical composition of Red Cadmium colors is more superior in strength than Yellow and Orange Cadmiums. The color of the paints is very rich, strong, and warm. In my opinion, this beautiful Color cannot be replaced by any other Reds. Thanks to its opaque characteristics, it has excellent covering properties. For years, there’s been the threat that all Cadmiums will be banned (however, the reasons for this potential decision are not entirely convincing for such a dramatic decision) but pigments are still available and I believe they will be always available, as the qualities of Cadmiums are excellent and it would be impossible to replace them. This colour is a brilliant substitute for Alizarin Crimson and it matches it visually. Alizarin Crimson, a paint that is liked by many artists, is brilliant in colour, but unfortunately it has a reputation of changing and is an unreliable paint. Scheveningen Red Deep is Old Hollands’ line of colours. This red paint is dark, transparent and cool with a slight tendency towards blue or violet. It could be added to other Reds to make them darker and deeper. It is ideal for transparent glazes. A Fast Drying paint. It is superb all around and is a pigment with moderate tinting strength and covering power. Ultramarine is a great color for glazing techniques, it is one of the few mineral colors that is totally transparent. Undoubtedly it is the most beautiful blue available on the market. The differences between Ultramarine Blue and French Ultramarine is not significant. It was invented by French chemist Guimet in the end of the 1820s as a synthetic replacement to the high-priced pigment derived from Lapis Lazuli. It was about a tenth of the cost of the natural Lapis Lazuli pigment. Natural ultramarine is a bit superior in its qualities than artificial is, and still remains a very expensive and rare pigment on today’s market. Artificial Ultramarine belongs to the same group as inexpensive paints. It is very close to the color, composition, and quality of natural Ultramarine, and it replaces it successfully. Before an artificial alternative was invented, it was a status symbol to own an oil painting made with expensive blues. The cost of Ultramarine was even higher than gold. Many painters who couldn’t afford such a costly pigment or just logistically were not able to acquire it, never used any blues at all in their paintings. Is a Fast Drying and an exceptionally beautiful, clean, rich and transparent paint. It was discovered by accident in the end of the 1920’s. When applied thickly – Phthalocyanine Blue looks like a very dark, intense blue. In my opinion, it would be advantageous to build up the darkness by applying the layer after layer of glazings, then to apply the paint thickly in one go. In galazes we will get an incredibly deep and vibrant blue, as a thin glaze it’s very clear and transparent. When mixed with white – it gives an impressive sky blue opaque color. This modern artificial pigment resembles Prussian Blue, however in an unmixed state it is slightly more cyan, and has a greenish cast; and like Prussian Blue paint, it has a tendency to look a bit bronze when dry. Phthalo can be a real challenge for beginners. It has enormous tinting strength – actually it has the most dominant tint power of any colour in the range and great caution should be taken when adding it to other paints. Add it carefully in petite quantities. Is a Fast Drying and Transparent paint. One more brilliant Phthalo paint on our palette; it possesses qualities similar to our previous paint – Phthalocyanine Blue. It is a radiant, rich and clear pigment. The color is a fierce acidic green with a blue undertone. Together with Phthalo Blue it is the strongest pigment in the range. Its colossal tint power dominates in any mixes. You have to get used to its extraordinary powerful abilities and use it with great care. Beginners, be aware! The paint is great in mixes with other colors and above all is great in fine layer glazings. When dry, as in the case of Phthalocyanine Blue, it has a tendency to look a bit bronze when used unmixed.